I have done my Bachelor's of Engineering in Biotechnology and I have a lot of interest in Research and Development. Apart from studies I like to tutor Mathematics and play cricket. 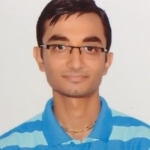 Did you find Mukul Dhingra via LearnPick?